The HP Color LaserJet CP3505dn series is a medium-sized, speedy color printer, perfect for a small office. This printer is intended for low to medium volume color printing. Our refurbished CP3505dn includes a built-in duplexer for two-sided printing, plus an Ethernet port for connecting the printer to a network. This printer comes with a 250-sheet paper cassette and a 100-sheet manual feed tray. Compared to HP's latest line of smaller color LaserJets, a refurbished CP3505dn can save you a bundle in printing costs! Check out toner cost comparisons below -- you'll be surprised at the savings! Toner cartridges for this model are good capacity, 6,000 page yield at 5% coverage. Smaller color LaserJets only print 2,000-4,000 pages per cartridge, resulting in a higher cost per page. 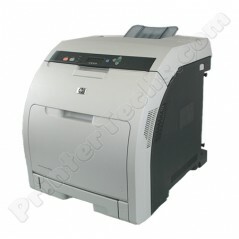 LaserJet CP3505 remanufactured toners are readily available and reasonably priced. Toner cartridges for new printers tend to be ridiculously expensive. See below for a cost analysis. When shopping for printers people usually forget to look at the cost of consumables (toner, transfer kit, fuser, etc). The total cost of owner ship is often ignored with printers. New printers are manufactured as vehicles to sell you more toner or ink. In many cases a set of new toner cartridges costs more than the new printer. But remember -- the cartridges that come with many new printers are only partially filled. The manufacturer wants you buying toner right away.